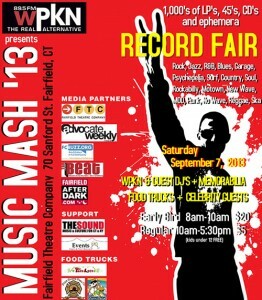 Music Mash ’13 is this year’s WPKN Record Fair, taking place on Saturday, September 7 at the Fairfield Theatre Company Annex at 70 Sanford Street, Fairfield, CT 06824 from 8 AM to 5:30 PM. Early Bird hours from 8 AM to 10 AM for a $20 admission fee. Regular admission begins at 10 AM for $5. Children under 12 admitted for free. Located across from the Fairfield Train Station, parking is plentiful and free. This event will feature a wide array of vendors and great opportunities to acquire some amazing albums, CDs and memorabilia. Featured special guests at the WPKN Booth: Chris Frantz & Tina Weymouth (Talking Heads and Tom Tom Club), Hilton Valentine (The Animals), Rusty Ford (Lothar & the Hand People), and Charlie Karp (Buddy Miles Express). 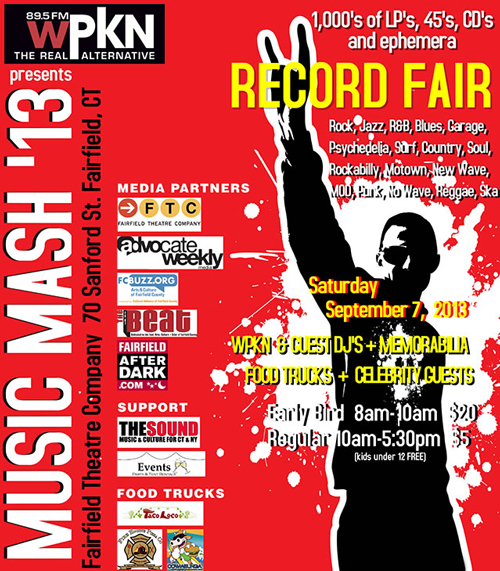 This event is made possible with support from: Fairfield Theatre Company, Advocate Weekly Media, FCBuzz.org, The Beat, FairfieldAfterDark.com, and The Sound Magazine.